In this video we're going to discuss template files. First of all why would one use a template file instead of a theme function? Now we've covered this pretty extensively in some previous videos, but let me make a few points before we get in to how to actually use a template file. First of all one reason we might end up using a template file, instead of a theme function is because the original theming occurs inside of a template file. And that means that overriding it is a lot easier if we also use a template file. A lot of times the developer either for Drupal core or for a contributed module uses a template file for a specific reason. And one of those is that it separates out the logic into preprocessing functions typically and makes the actual themeable output in html file with minimal php code inside of it. That means that when a themer needs to go and modify how a node looks, they simply open up the node dot tpl dot php file, and all there is is a bunch of html and some minimal php inside of it. Take this in contrast to opening up the template dot php file which may have a dozen or more functions inside of it. And a themer then has to distinguish between the parts that they're going to work with and the parts that they can simply ignore. Finally one benefit to using template files, if you have a choice to use a template file or a theme function, is that it's easier to see at a glance what being overridden at the theme layer. If we want to figure what theme functions are being overridden, we have to open up template dot php. However, if we're looking at simply the template files that are being overridden, we can easily see just looking at the file structure of the theme which template files are being overridden specifically. Because they'll just be listed there. Let's go ahead and begin by creating a template file override for a node. First of all, I'm going to jump to my resource pack directory, and go ahead and copy the batoverrides folder and its entirety. And then go to your Drupal site directory and paste it inside of the sites, all, themes directory. This folder is a theme that we're going to use as a basis for our examples in this chapter. And it contains a sub-theme if you expand the folder, you'll see that it contains a dot info file, a logo file and a template folder as well as the steps folder. Now this is a sub-theme of the bartik base theme and so it just has the minimal requirements for a sub-theme. We are going to begin by overriding the node template file because this is one of the most common ones that needs to be overridden. Because this is a bartik sub-theme we can go ahead and copy the node dot tpl dot php file from bartik directly. 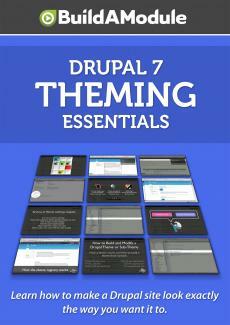 So go ahead and expand your themes directory that's in your base directory for your Drupal site. Expand bartik, scroll down and go ahead and expand the templates directory and we're going to go ahead and copy the node dot tpl dot php file. And then go ahead and paste it in the templates directory in batoverrides. Okay. Now in order to make sure that we know that our node dot tpl dot php file is being registered we can do a couple of things. One, we can enable the theme developer module download the contributed module and then enable it in order to see where our node template file resides. Or we can simply change some of the output inside of the node dot tpl dot php file to determine when our template file is being used. So go ahead an open up the node dot tpl dot php file, and what I'm going to do is just to select the entire content and then I'm just going to put a few random letters inside of this. I'm going to jump back to the browser, and let's go ahead and enable our theme. Go ahead and click on the appearance link. And then at the bottom of this page there will be a new disabled theme called Build a Theme Override Examples. And we're just going to go ahead enable and set default. I'm going to go ahead and jump to the homepage. And we'll see that instead of displaying a list of nodes on our homepage, we're seeing a bunch of random letters. And if we use the theme developer module, I'm just going to click this checkbox in the lower left-hand corner, and we hover over one of these items. We'll see that this is using a template in our sites, all, themes, batoverrides, templates directory called node dot tpl dot php and that's the one that we were just modifying. So if we jump back to our editor and we undo our intentional overriding of the output here and save it and jump back to our browser. We can refresh the page and see what our nodes would look like using this node dot tpl dot php file in its base form. At this point we can them modify the template however we'd like. Now a lot of times we'll want to modify the node template based on certain criteria. For example we want the node template file to be overridden for only a certain content type. And this brings us to the idea of template suggestions. So I'm going to go ahead and demonstrate how to create a template suggestion for the article node content type and then we'll talk about that structure a little bit and look at a couple of other examples. Go ahead and jump to your theme directory, your batoverrides theme directory here and we're going to change the name of node dot tpl dot php to node dash dash article dot tpl dot php. Now this is a new suggestion that will target simply the content type called article and none of the other ones. Let's go ahead and open this up. It will be a new file for us. And let's do the same trick that we did earlier and just put in some random content for this node. Go ahead and jump back to your browser and if you refresh the page at this point, you'll see some differences with our nodes. For example there's no title here.